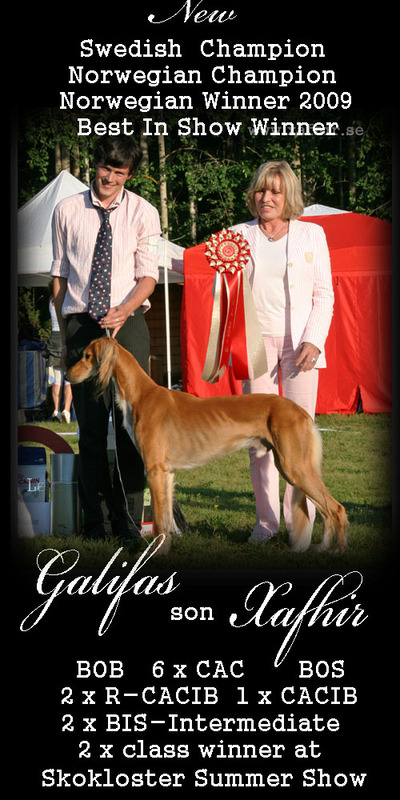 Galifa's son the first Champion of the litter. Everyone who looks on my site has noticed that I love my Salukis. And of all these beautiful creatures you see the most favourite on this collage. Her official name is Desert Queen, but I call her Godeliefje. I have promised her to spend every year on her birthday some hours with her and her daughter on the Dutch desert, the Kootwijker Zand. And we did indeed at the 10th of September 2009 when she was 12 years old. I hope that we can do that some years more. The collage is made by Linda Boväng. 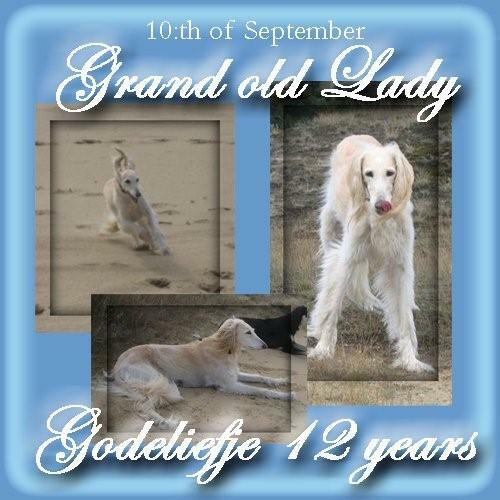 Godeliefje almost 12 years old, won the second place with Excellent in the Veteran Class. 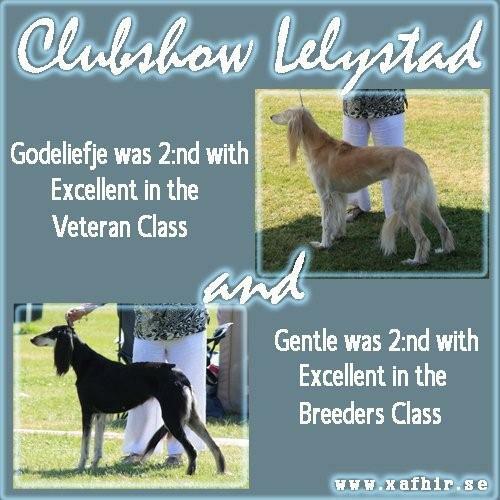 Gentle was second in the Breeders Class with Excellent. 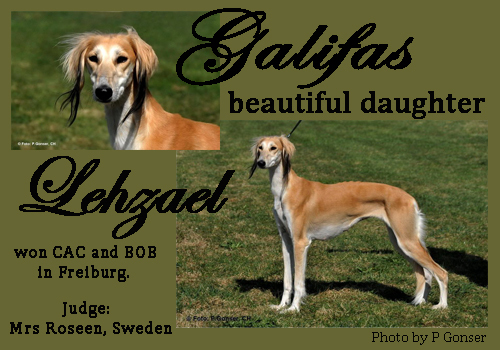 Entry of 65 Salukis. 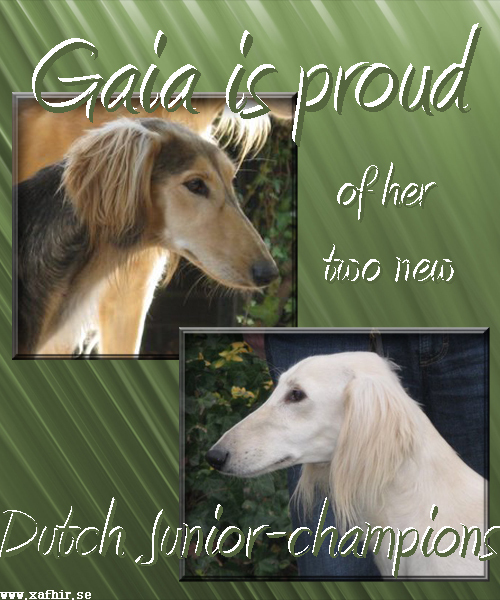 'Godeliefje' with her official name Desert Queen is not only a queen,but also a Veteran Champion. During a visit to our neighbour country Germany the judge of the show granted her the title German Veteran Champion because of the beauty at her age. Hurrah for my darling!